Preheat the oven to 350°F. Grease and 8x8-inch mold. Set aside. Mix the flour, salt and baking soda in a small bowl. Set aside. Whip the butter and sugar with a hand mixer at medium speed until the mixture is pale, about 3 minutes. Add the eggs, one at a time, and continue mixing. Add the milk bit by bit until it’s all been added. Lower the speed and add the flour mixture, combine until you have an even consistency. Add the cheese and mix until well combined. Place the mixture in the mold and bake for 35-40 minutes or until its firm and lightly browned. You can use fresh corn or canned corn; just make sure they’re well strained. 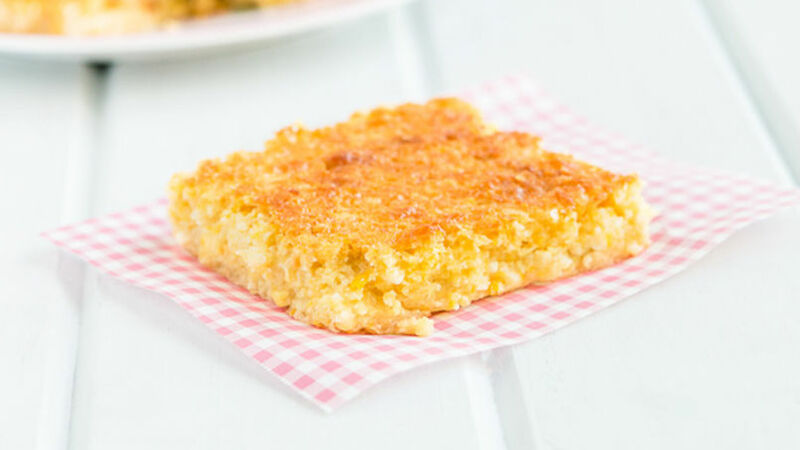 Torta de Jojoto (corn) is a classic Venezuelan dish. I love it and best of all, it’s very easy to make. The special touch comes from the cheese; it adds a unique and delicious flavor. It’s best to use corn while it’s in season, otherwise you can use canned corn. Enjoy!